The layout of the kitchen, like it or not, revolves around a refrigerator. But sometimes, the way it looks doesn’t make us happy. Or the kitchen is so tiny that there’s no room for a fridge at all. Or we want to design our kitchen in the style of a medieval castle or Provence countryside and a sleek glossy refrigerator doesn’t blend with this concept. 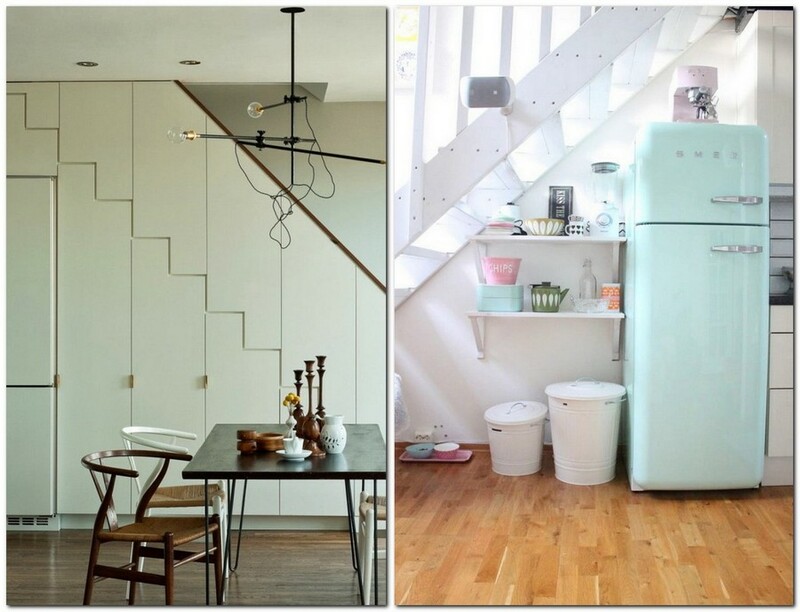 Finally, sometimes we want to disguise a fridge just because this is the only way to stop looking into it every 30 minutes So, is there a way to conceal such a big element of kitchen interior? Yes! There are at least 7 options that we’d like to offer you now. Firstly, you should consider an option of shifting a fridge to some other room. In fact, some people keep refrigerators in hallways or corridors and it’s even possible to disguise this appliance in a living room. But at first you should consider the following issues: won’t it disturb anybody’s work, rest or sleep with permanent noise and who will get a 24-hour access to its interior? A good location is a recessed balcony. But it must comply with all the technical requirements: the room has to be properly aired, warm in the winter time and adequately moist. Otherwise the fridge may just break down. Also, you have to make sure that the appliance is not exposed to direct sunlight – this will surge your electricity bills and damage the fridge pretty fast. You may also try to break down the wall between the kitchen and the loggia; unless technical and legal difficulties do not scare you (remember that you’d have to receive the agreement of all your family members, neighbors and respective communal authorities). At least, you can make a small interior window to bring food to the kitchen easier. Maybe you’re single or just don’t cook at home and even a mini-fridge would be enough for you? Or perhaps, you’re ready to abandon a freezer or install a freezer-fridge separately? This might save space and hiding smaller “components” of the appliance would be far easier. 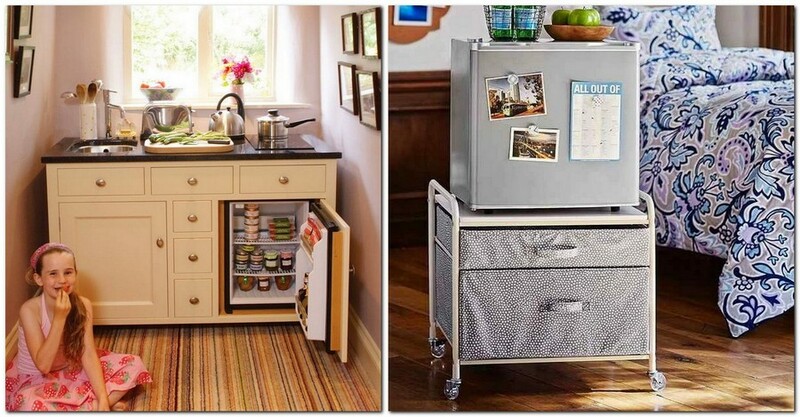 Finally, a mini-refrigerator can be put even in a bedroom. So, in a word, before buying a traditional refrigerator you should consider your habits and lifestyle more carefully. 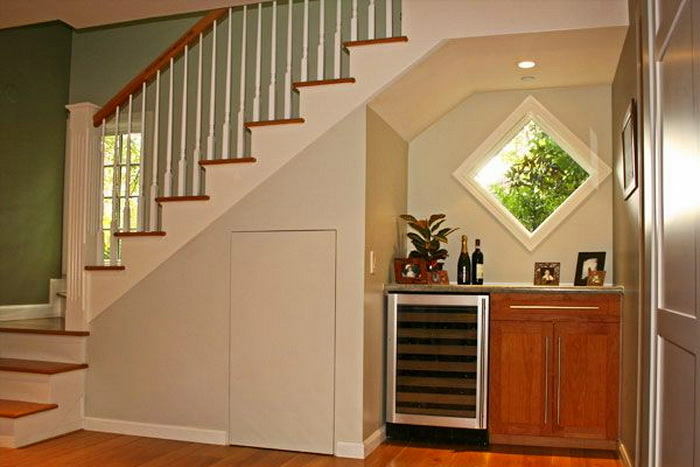 Why not hide a refrigerator under a staircase? As a rule, there’s enough place for a recess or a full-fledged walk-in pantry there. But choosing this option, you should take care about installing a heat sink, since a fridge stuck in a tiny recess is likely to overheat pretty fast. Here you may ask a quite logical question: if I hide a fridge in a closet, where am I supposed to hide a closet? In fact, you don’t have to hide it anywhere, if its appearance suits you and fits into your kitchen better than a glossy metal giant. Ready-made kitchen suites can include a built-in refrigerator originally and it would perfectly blend with the entire set. 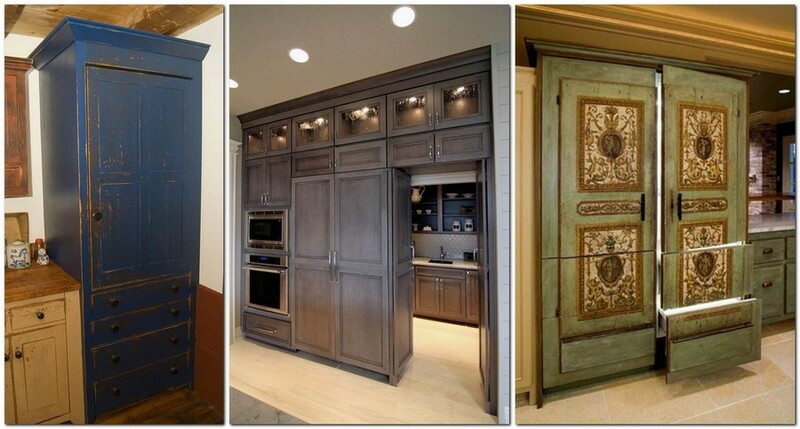 Alternatively, you may find or make a closet for your fridge to your taste. But remember that the back side of the closet should be equipped with a vent grate. 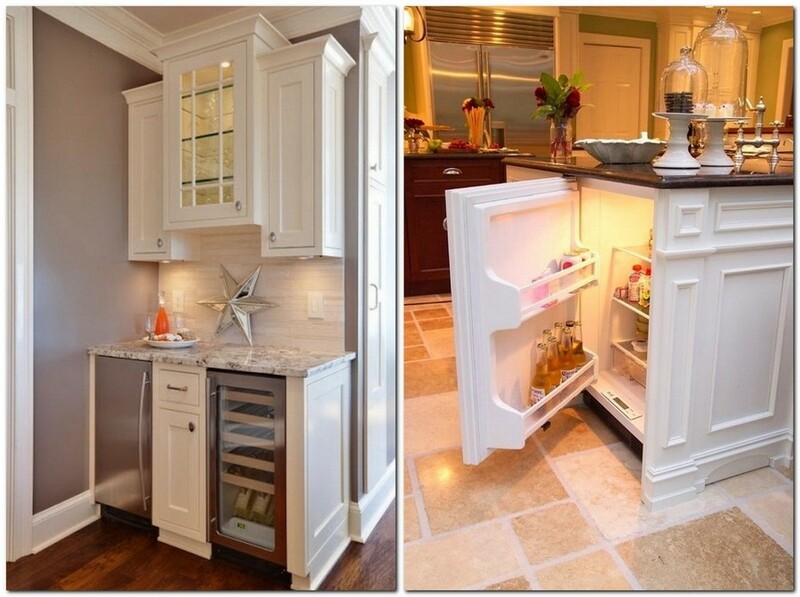 Probably, hiding a refrigerator in plain sight is the most unexpected solution. Just disguise it as something else, for example, as a blackboard. Just a can of chalkboard paint and this effect can be created on any surface. To crown it all, you’ll get a nice board for leaving notes, putting down recipes and shopping lists, and just drawing some funny things. This is something more than just a camouflage. Your fridge can be turned into a spaceship with the help of adhesive vinyl film. Or in an art gallery. Or in an exhibition of your best photos. Finally, tasteful magnets brought from your holidays can turn it into a museum. 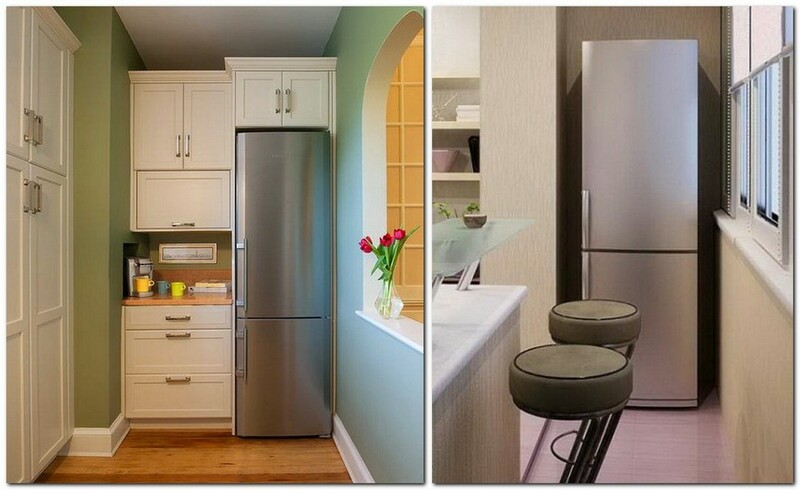 This way your fridge’s updated look would bring you positive emotions and eliminate the need to hide it. Finally, you may decorate your refrigerator as a piece of art. You may either make it on your own, or use full-size magnetic panels with versatile stunning effects. 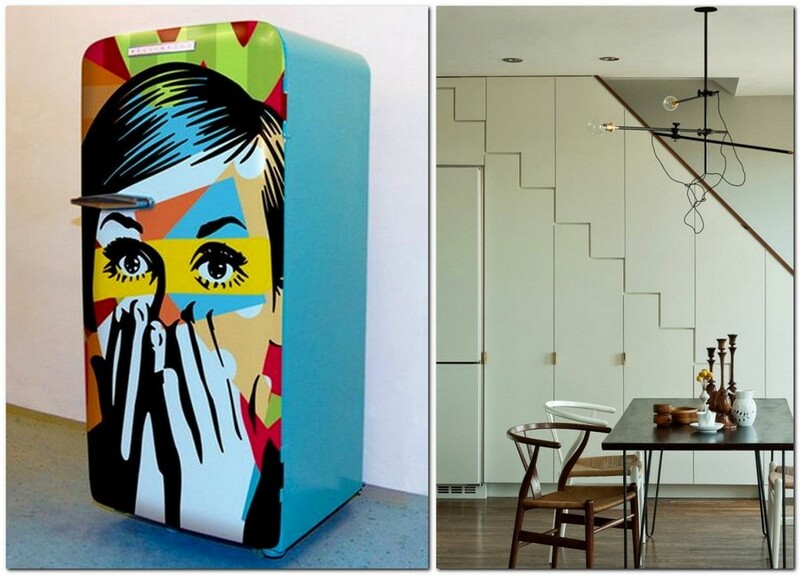 This way the fridge may perfectly fit into the aesthetics of pop art, or an imitation of an old Provence coffee house. And if you’re renting or just don’t feel sure about your talents – you may get multicolor paper adhesive tape or a textile alternative dubbed Washi Tape (it can be found in a DIY store). 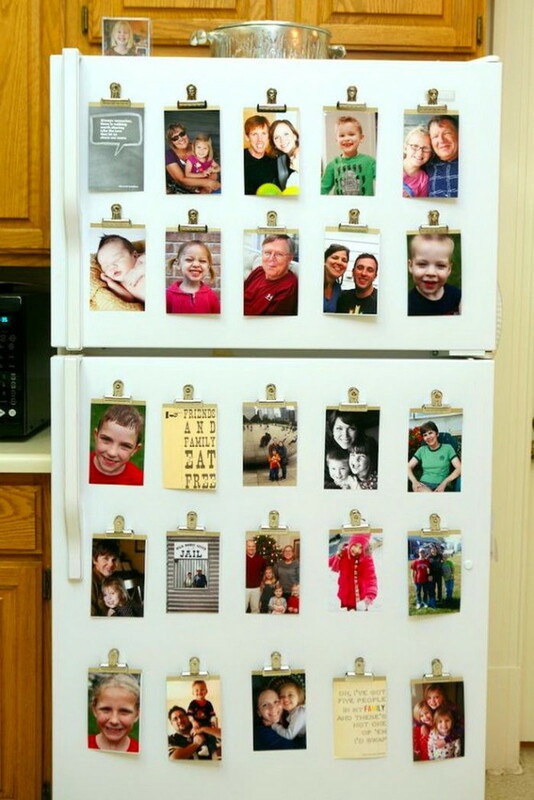 Amazingly, even simple multicolor strips can make a refrigerator far more attractive.